Alexander Bermange‘s new album of songs, Wit and Whimsy, hit the number 1 spot on i-Tunes’ comedy chart on the day of its release – appropriately enough on 1st April (and it wasn’t an April Fools prank!) Alexander’s songs have, of course, been featured in a number of NMN’s Snappy Title concerts in recent years. Wit & Whimsy boasts several “national treasures”; numerous Olivier and WhatsOnStage Award winners and nominees of the last few years; and the current stars of many West End and touring musicals including Mamma Mia!, Wicked, Jersey Boys, Beautiful and Half A Sixpence. The complete line-up is: Simon Bailey, Lucy May Barker, Ian Bartholomew, Gina Beck, David Bedella, Tracie Bennett, Sanne den Besten, Christopher Biggins, Richard Carson, Anna-Jane Casey, Phil Daniels, Cassidy Janson, Amy Lennox, Sam Lupton, Miriam Margolyes, Craig Mather, Laura Pitt-Pulford, Nigel Planer, Ben Richards, Lauren Samuels, Oliver Savile, Gemma Sutton and Emma Williams. The album is produced by Mike Dixon, who has worked as Musical Supervisor on many long-running shows around the world. All of the tracks are written by Alexander S. Bermange, who has acquired a formidable following amongst millions of radio listeners through his many appearances performing his comic songs on BBC Radio 4 and the BBC World Service. Further writing credits for which Alexander has achieved recognition include musicals and theatre productions that have been produced in the West End, around the UK and internationally. Wit & Whimsy comprises Alexander’s most popular comedic musical creations from his stage shows and beyond. Many humorously depict aspects of musical theatre itself – such as Audition, A Serious Actor, The Opening Number, Stuck In The Ensemble, It’s Lovely Being A Luvvie, and I Wish That My Life Were Like A Musical. Others are portraits of crazy characters such as obsessive trainspotters, tone-deaf singers or would-be fairy-tale princesses; others are tongue-in-cheek celebrations of modern day technology, automated telephone answering systems, or the world of cinema; others take the form of tales with twists or tongue-twisting lists. They are all certain to amuse and entertain in equal measure. 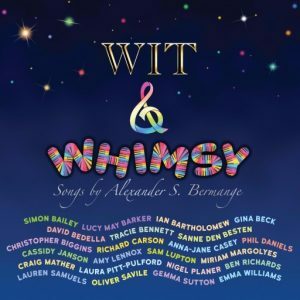 Wit & Whimsy is now available as a deluxe 2 CD set from Dress Circle (http://bit.ly/WitWhimsy) and as a download from iTunes (http://apple.co/2lX41rh) on the Spectacular Music label. A live show featuring performances of songs from the album is being staged at The Hippodrome in London’s West End on Sunday 30th April, tickets for which are available at http://tinyurl.com/jpmudzo. Sunday 4th June 2017 at The Pheasantry, King’s Road, Chelsea. NEW MUSICALS NETWORK are delighted to present their latest SNAPPY TITLE SPOTLIGHT event. One morning eight years ago actor/singer/songwriter TIM THOMAS awoke with a single thought in his head, “I will write musicals!” Quite where that concept sprang from is still a mystery even to Tim himself. But, fired up and eager to start, he flung himself into the task. Results rapidly followed and as the months passed plots developed, tunes spirited themselves out of the air, themes caught his imagination and four distinct shows took shape. His efforts were aided by the breadth of his experience. Over the years Tim had become a journeyman, an adept in the theatre working as an actor and singer but also as a writer of plays and cabaret. He had even had a band in the distant past called “Telltale” who had great success on the children’s TV show RAINBOW. Tim had written the lyrics and sung the show’s celebrated theme-song. So fortified with this background Tim was writing book, lyrics and music, always determined to be completely original and not to adapt other people’s work. The first musical to hit the stage was a poignant piece called SHELLSHOCK which had a brilliant two-week run at The Waterloo East Theatre. A song from Shellshock was featured in Snappy Title Making History last year. As Tim found, creating musicals can be a very tough and solitary business. Why not gather a group of bright souls together to share the dream? Two years ago Tim met a bunch of scintillating, unusual talents, singers and instrumentalists who did not want to compromise, who wanted to aim high. Three of them, Amie Miller, Nic Chiappetta and Connor Going already knew each other from the Royal Academy of Music. Suzie Aries was queen of the cruise-ships. So, now there are now five in the band – AUTHENTIC BLUE. They have a lot of laughs. They have dealt with all sorts of mishaps. They are very good friends. The group perform concerts, develop the shows, record Tim’s original stuff and they do covers. Material by the band is on YouTube, Facebook, Spotify etc., and they have performed in some wonderful venues. Working this way has liberated a lot of energies and, in the world of musicals, it is pretty unusual. As of today there are three musicals in development plus a couple of previously-produced works and you will hear songs from all of them. 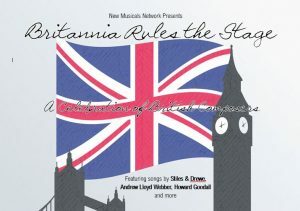 Book now for Britannia Rules The Stage! 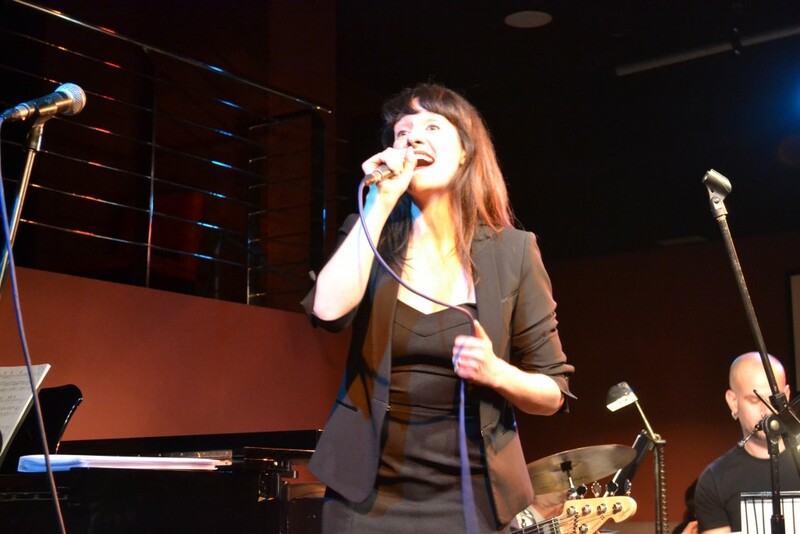 With under a week to go, we would like to remind you about the first Snappy Title Spotlight concert at the Pheasantry, Britannia Rules The Stage. This is a celebration of the best of British musical theatre old and new, and this time proceeds from the show will be going to The Alzheimer’s Society – a cause which we know is close to many people’s hearts. Will Barratt (Jesus Christ Superstar, War of the Worlds, Phantom of the Opera) singing Gethsemane from Jesus Christ Superstar. That’s just to whet your appetite – there’s lots more wonderful stuff on the programme! It should be a wonderful concert, and we look forward to seeing you there – hope you can make it! We at NMN are thrilled to tell you about three exciting concerts coming up soon under the generic title Snappy Title Spotlight. On 16th October Jemima Rooper leads the cast in Britannia Rules The Stage. This charity concert in aid of The Alzheimer’s Society will be a celebration of British musicals old and new, and will contain songs by Andrew Lloyd Webber, Elton John, Stiles and Drewe, Pippa Cleary and Jake Brunger, Howard Goodall, and others. We are still adding cast members, but so far, as well as Jemima Rooper, we have Will Barratt, Sharan Phull, Jess Singer and Imogen Gurney joining us. 23rd October is an evening devoted to the songs of Stiles and Drewe prizewinner Mark Allcorn. With influences such as Tim Minchin, Marvin Hamlisch, Randy Newman and Robert Lopez, Mark introduces us to an eclectic mix of cabaret, comedy and musical theatre songs. His music has been performed in numerous London cabarets and showcases over the last few years and with 3 musicals and 2 albums to his name, finally we have an opportunity to hear an evening dedicated to his music. Cast includes Will Barratt, Alex Young, Jordan Langford, Laura Kaye Thomson, Nathan Lodge, Laura Johnson and Dave O’Mahony. And finally, on 20th November there will be the chance to hear a collection of songs by Mark Goldthorp. Mark, of course, is a highly respected actor and musician, and has appeared on the West End stage (Avenue Q, Sunset Boulevard, Matilda) and on TV (My Family, Sarah Jane Adventures). Mark is also a prolific composer of songs and musicals and this evening is a rare treat – a chance to hear the best of his output performed by a wonderful cast of performers, featuring Dianne Pilkington, Caroline Sheen, Alice Fearn, Matt Harrop, Martin Neely, Tim Rogers and Patrick Smyth. For all concerts, artists appear subject to availability. We really hope you will be able to support some or all of these concerts – they will be three very different, but very special, evenings of musical theatre. If you are unable to come, please feel free to share the details as widely as you can! Looking forward to seeing you at Snappy Title Spotlight! Actor/singer/songwriter Alex James Ellison, who recently supported Samantha Barks on her UK concert tour, will present a concert of songs with his music performed by himself and some special guests from the world of West End musical theatre at the Union Theatre on Sunday October 2. Alex has performed gigs all around London and the UK, played roles in a number of Off-West End musicals, including “Apartment 40C” (St James Studio and London Theatre Workshop) and “Whistle Down The Wind” (Union Theatre), and starred in “Aliens Love Underpants” on tour and at the Dominion Theatre. 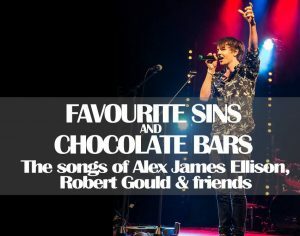 In “Favourite Sins and Chocolate Bars”, Alex will perform his own unique brand of music (described as “fun pop mixed with sincere singer-songwriter”) – including songs from his debut EP “Duvet Days” and his hit single “Chocolate Bar”. He will joined by guest vocalists, who will sing covers of his singer-songwriter catalogue (a number of which were co-written with actor-singer-songwriter Joe Sterling, who is currently playing Art Garfunkel in the International Tour of The Simon And Garfunkel Story) as well as numbers from the upcoming EP of songs he has written with Robert Gould (librettist/lyricist of the musicals “My Land’s Shore” and “A Pebble For Aaron”, which were named as finalists for the 2016 Stiles And Drewe Mentorship Award). The concert will also showcase some songs from the new Ellison and Gould musical-in-development “Texting and Tweeting – the Musical”! 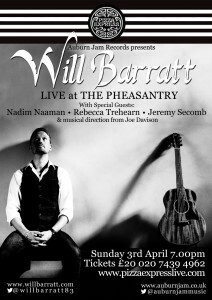 Will Barratt proved a hugely popular member of our cast at Snappy Title: Making History, NMN’s recent showcase of new songs at major London cabaret venue The Pheasantry. Following a sell-out launch gig and much critical acclaim for his debut album, ‘Confessions of a Justified Sinner’, West End performer and accomplished songwriter Will Barratt (The Producers, Les Miserables, Sweeney Todd, The Phantom of the Opera, Jersey Boys) quickly rose to the top 20 of the iTunes Singer/Songwriter chart. Auburn Jam Records invites you to join Will, his band and West End friends Rebecca Trehearn (Showboat, City of Angels, Ghost), Nadim Naaman (Phantom of the Opera, Sweeney Todd, The Sound of Music) and Jeremy Secomb (Les Miserables, Sweeney Todd, Phantom of the Opera), for a night packed with material from the album and songs from many great artists who have inspired Will’s writing & career. Photographs from NMN’s recent charity showcase of new musical theatre writing are now available for viewing. All profits from the show are being donated to the charity, MyAware, which supports sufferers from the condition myasthenia gravis and their families. 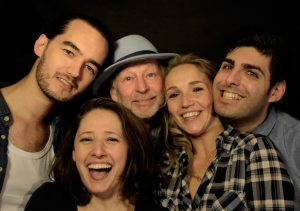 The photographs (taken by co-producer of the show Katy Auker) can be accessed HERE. Thursday 28th January 2016 – Auburn Jam Records are delighted to announce the release today of Alzheimer’s Society charity single ‘Dignity’, written by trans-Atlantic writing duo Anderson & Petty, and featuring the vocals of West End leading lady Gloria Onitiri (The Bodyguard, The Lion King, Avenue Q). The single is available to download via all major online stores including iTunes, Google Play and Amazon, and the official video can be found on YouTube. A JustGiving page has also been set up to collect donations from anyone who enjoys the song and would like to give more to support the important work of Alzheimer’s Society. All donations and profits from the single will go to Alzheimer’s Society, the leading UK care and research charity for people with Alzheimer’s disease and other dementias, their families and carers. Dementia can happen to anyone and there is currently no cure. There are 850,000 people with dementia in the UK and the number is set to rise to 1 million by 2021. Alzheimer’s Society believe passionately that life doesn’t end when dementia begins. They are there for anyone affected by dementia, and do everything they can to keep people with dementia connected to their lives and the people who matter most. We’d like to send hearty congratulations to all the composers and writers whose work has been selected for performance at our forthcoming showcase of new musical theatre songs, Snappy Title: Making History. There were some fantastic songs sent in, and the selection wasn’t easy! Kara Taylor Alberts, Mark Allcorn, Alexander Bermange, Charles Bloom, Mark Bunyan, Ian Cook and Ian Newton, Dan Furman, Mark Goldthorp, Bob Gould and Chris Orton, Alan Lewis, Annemarie Lewis-Thomas, Eamonn O’Dwyer and Tim Thomas. Snappy Title: Making History will be at The Pheasantry, King’s Road, London SW3 4UT for one night only – Sunday 21st February 2016 at 8.00pm. The concert will feature an array of West End artists, including Kirsty Hoiles, Martin Neely, Alice Fearn, Jess Singer and Jordan Langford, plus a live 4-piece band. The programme will combine the new songs with well-known songs from established musicals, so there really will be something for all tastes! The closing date for submitting songs for consideration to be included in next February’s showcase, Snappy Title: Making History, was Friday 18th December. We have had an impressively large number of excellent songs, which is brilliant news – but, allowing for the Christmas break, we’re not yet in a position to make any announcements about which songs will make it onto the programme. It will be a few more days until we will reach that stage, so if you are a composer who has entered a song (or songs) please bear with us for a little while longer. Please be assured that it is our policy to contact everyone who entered songs with news of the outcome of their submission, whether or not it was successful, although we regret we cannot offer any feedback on this occasion.